To strengthen the Prakasam Barrage, Irrigation Department has started the apron works with Rs.24 crores. 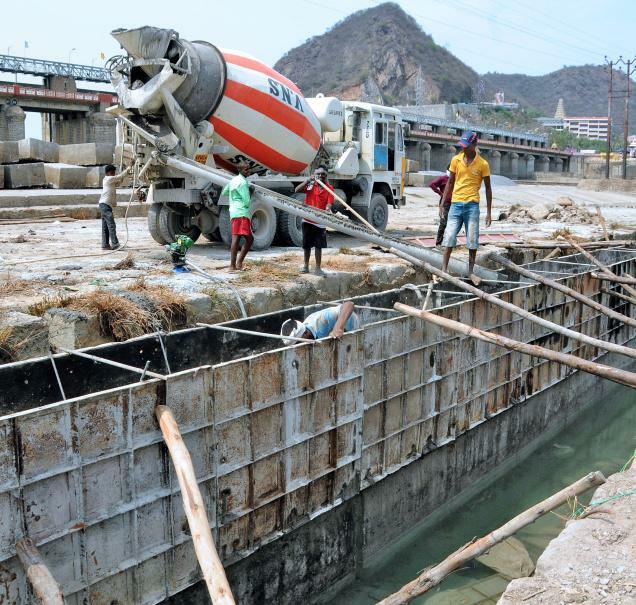 At the downstream of the barrage, a big concrete retaining is being constructed. The apron wall is constructed with big rocks and also some part of concrete. Space is being created for big stones, so that the river flow will not destroy the apron. Heavy cranes are being used to arrange the big blocks and rocks. Also the movement of the trucks bringing concrete is also being observed in the downstream of the barrage. The works will continue till the end of the season. Also the patch works wherever required also will be done. The barrage is being constructed in the year 1957. Instead of using it for irrigation, the barrage is being used to store the water for Vijayawada Thermal Power Station and the problems have been started. According to the original design, the cistern upstream the barrage should be drained completely during the summers and repairs conducted, but water was stored throughout the year.